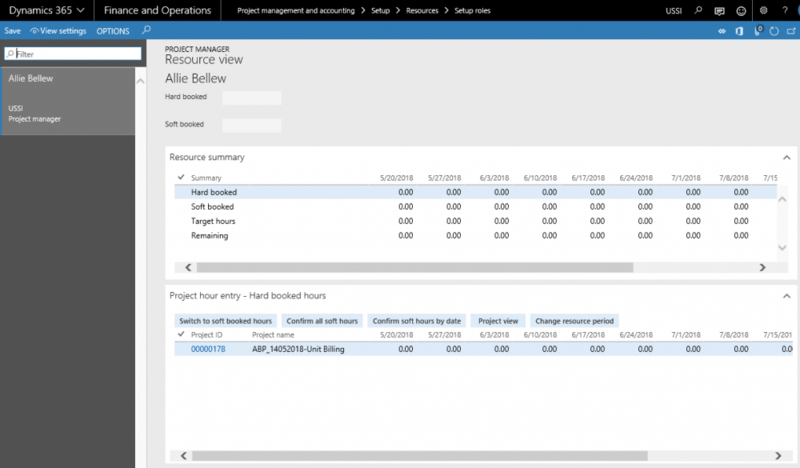 *Before using the Projects+ resourcing functionality, a few things need to be configured. This section details those setups. Activate resourcing enhancement – With options of yes and no. Yes, will activate the Projects+ resourcing functionality. Original model – Where the user can choose a forecast model to be the original resource forecast model. Resource budget model – The forecast model chosen for this will be used as the current budget model to which the resourcing modifications can be done. 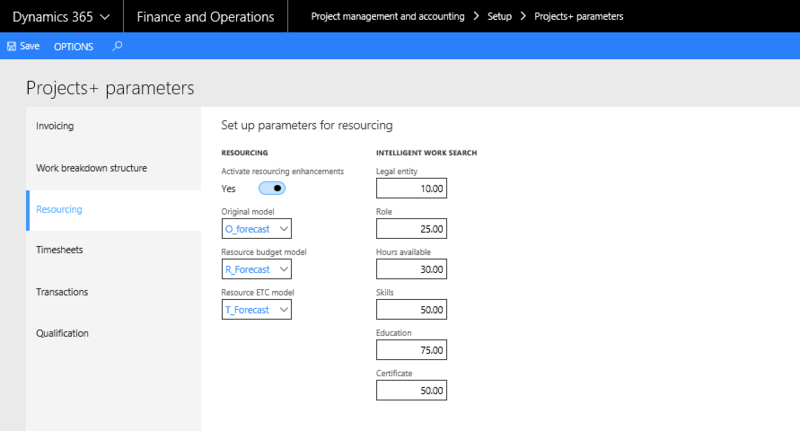 Resource ETC Model – The forecast model chosen for this field will be used to hold the transferred resourcing lines that are to be completed from the current forecast model. Intelligent Work Search – There is a new parameter to match score to default onto the Intelligent work search and Intelligent resource fulfillment forms. Where the users can enter the weightage against each attribute so that the same is matched while looking up resources when doing resource fulfillment. These values defined here will default onto the form. A new form was added in resource roles to look up roles apart from the specified roles; it is called the dependent roles. This form is available as a button on the setup roles form, as shown in the subsequent sections. Also another form called ‘Resource view’ was added to see the resource belonging to that role in one place. In the resource role form the user can associate a category to a role, this will then default on the resource forecast line, when the role is selected. A new Form was added in resource roles to look up for roles apart from the specified roles; it is called the dependent roles. This form is available as a button on the setup roles form, as shown in the below screenshot. The user would have to choose a role and then click on dependent role, to choose the role that he would also like to look up for during the Intelligent resource/work form. So as per the screenshots, while looking up for Software developer role, even project managers will also be considered. New form called ‘Resource view’ added on setup roles form to look up for all the resources who are having selected roles and booked hours against them. The below form was added as part of Projects+ development and shows the resources against role selected on the setup roles form. This form also shows the variety of hours i.e. hard booked, soft booked, target and remaining hours assigned to each resource. On the same form, the bottom grid displays the projects against which the selected resource is associated and hours on each week\days.